Silvia Eberly lives and breathes accordion. As she describes how the instrument has shaped her entire 60 years, she gestures as if an accordion were still at her fingertips. “This was one way to promote the accordion,” he said. While the national initiative is recognized during the month of June, Eberly promotes, plays and practices the accordion all year round. She and her star pupil, Michael Leggett Jr., of Waldorf, Md., recently returned from the National Button Accordion Festival held in Bessemer, PA, and she regularly performs at The Old Stein Inn in Edgewater, Md. and Café Mozart in Washington, D.C.
Leggett has played at the German-American Heritage Museum and the Biergarten Haus, both in D.C.
And come October, the two are entirely booked with Oktoberfest parties. But it was more than 50 years ago, in a place thousands of miles away, when Eberly first picked up her beloved instrument. Growing up, there was always music playing in her small house in Austria, she said, and talent saturated her family’s pedigree. Her father, mother and her grandmother played the accordion; her great-grandfather was a composer and her great-grandmother was a famous folk singer and yodeler. On Sundays, her entire family would get together to sing and play music. “I didn’t have a TV!” Eberly exclaimed. She remembers watching her father come home from a long shift as a police officer and tinker with the accordion as a way to relax. But if it weren’t for Eberly’s grandmater – as she refers to her with her in a thick Austria accent – she never would have taken up the accordion. Eberly was raised by her grandmother, who spent 100 shillings each week on accordion lessons for her granddaughter. Talking about her grandmother, Eberly’s voice quiets as if this were the nostalgic part in her accordion solo. And, while only receiving 600 shillings per month from the government, that was a big chunk of change. “We didn’t eat much, I can tell you that,” Eberly said laughing. But if it weren’t for her grandmater, “I wouldn’t be me,” she added. When she was 32, Eberly came to the U.S., and got married. She had a number of different jobs, from working as a cook, to an accountant in the payroll department at the Washington Times. But the accordion was still very much a part of her – and her family’s – life. 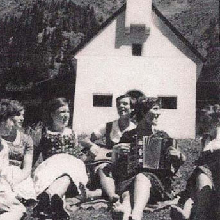 Although she said she never pushed the accordion on her children, when they were little they took part in some performances, particularly at The Old Stein Inn. In the past few years, Eberly has also taken on teaching, fixing and selling the accordion. She claims she’s a better teacher than performer, because of her patience and her amicable personality. In describing her students, who come from all walks of life, Eberly beams, her voice picks up again and her hands mimic her excitement. Many of her students are of European and South American backgrounds, from countries where the accordion is very popular and ingrained in the culture. It seems Eberly really has found her niche in teaching. “Believe me, the accordion is coming back,” she said definitively. “I think it has made a comeback,” he said, attributing the instrument’s surge in popularity to new ethnic bands popping up, mainstream rock incorporating the accordion and increased awareness. “Twenty years ago, if I said I played the accordion, people would snicker. Now everybody says, ‘Wow that’s really such a fun instrument,’” Torriglia said. Although National Accordion Awareness Month is coming to a close, Eberly and her accordion will remain inseparable. “Some people have a certain course in life – a calling – mine is the accordion,” she said with a smile. For more information about Eberly visit magicmountainpuppets.com.